Not a boat to be found. 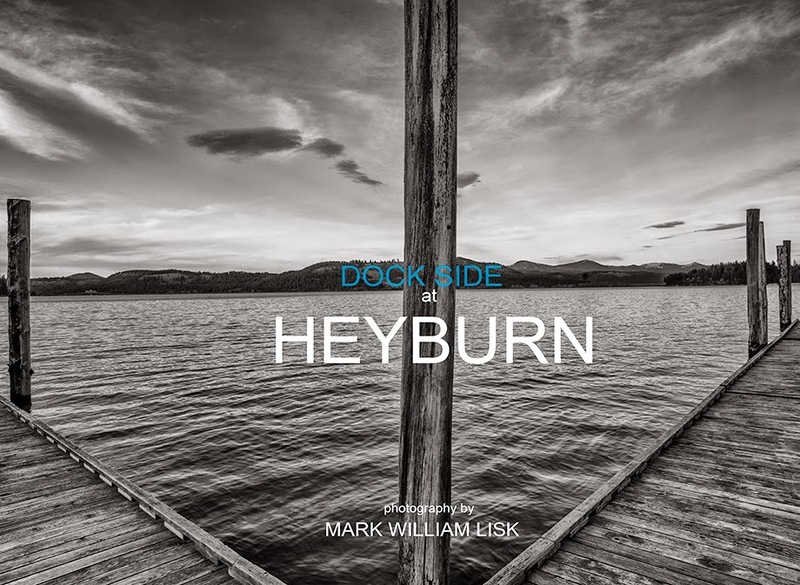 Preseason and still a bit cold for most visiting tourists, Heyburn State Park was left uninhabited and open for exploration. 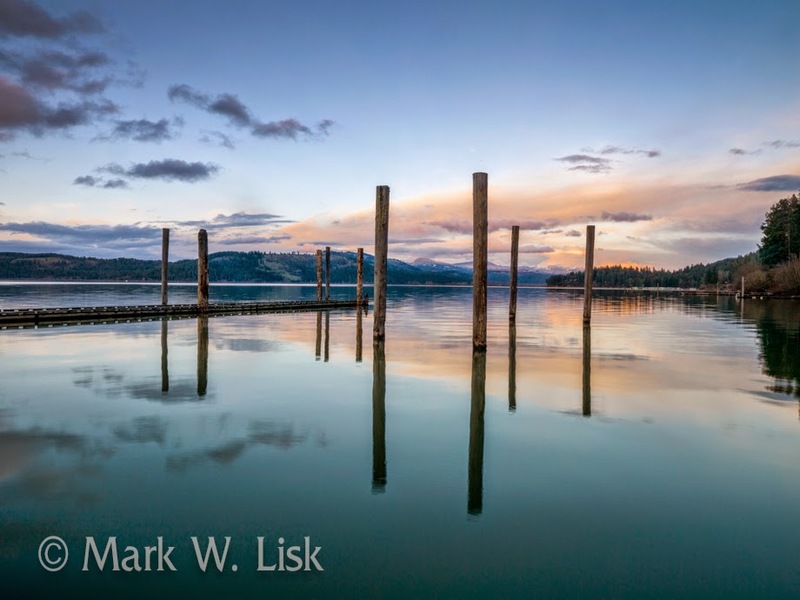 Lost in time, feeling like I was the only person on the planet, totally absorbed photographing the old school wooden docks floating in Chatcolet Bay. Just me and my dog, how much better could it get. Heyburn State Park is the oldest park in the Pacific Northwest, Established in 1908 sitting on 5500 acres of land and 2300 acres of water. 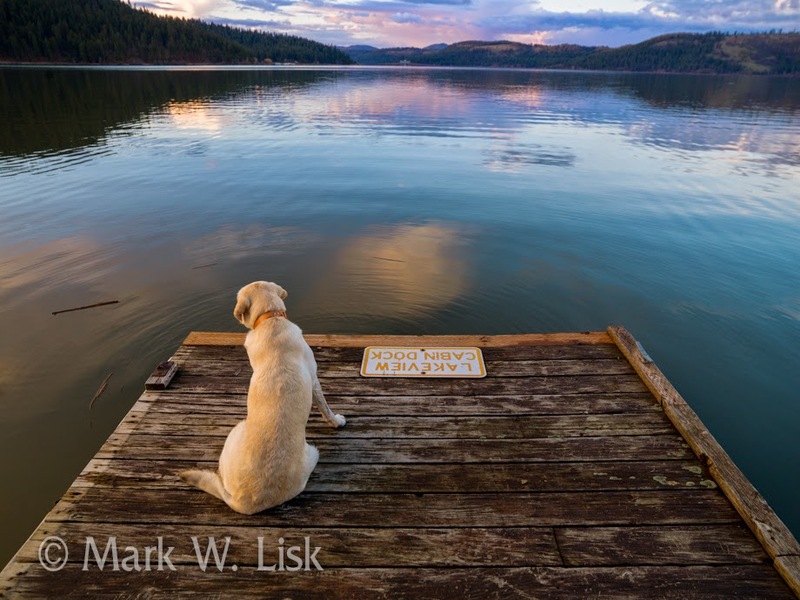 Three mountain lakes are incorporated into the park; Chatcolet, Benewah, and Hidden Lakes. with the St. Joe River along the eastern edge of the park. This is a very tranquil place, a throw back to the classic parks of the 40s and 50s. A step back to a simpler time. The raven speaks, calling from the walls of the vertical sedimentary cliffs that drop away then down to the river. Slashing upward, the sinister ebony silhouette enters the azure sky above the rim and soars over the reef in an area known as the wedge....the ravens echo welcomes me back to the canyon. From the Wedge Overlook the San Rafael River passes through a twisted stone maze and cuts deep across and earthen reef, and into the swell. 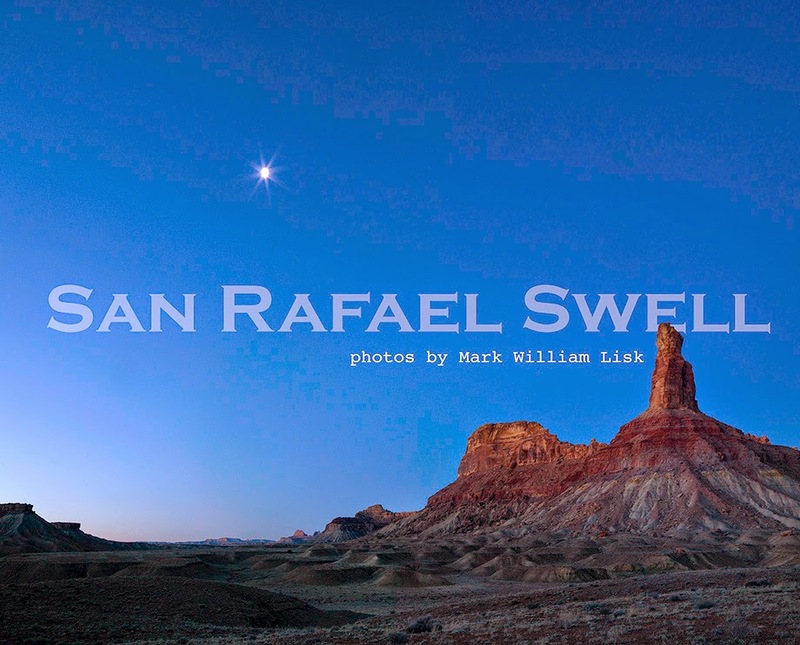 The San Rafael Swell is a huge anticline dome formed by pressure, stacked up and pushed to the surface along a fault line more than 70 million years ago and covers an area of 4,472 sq. miles. 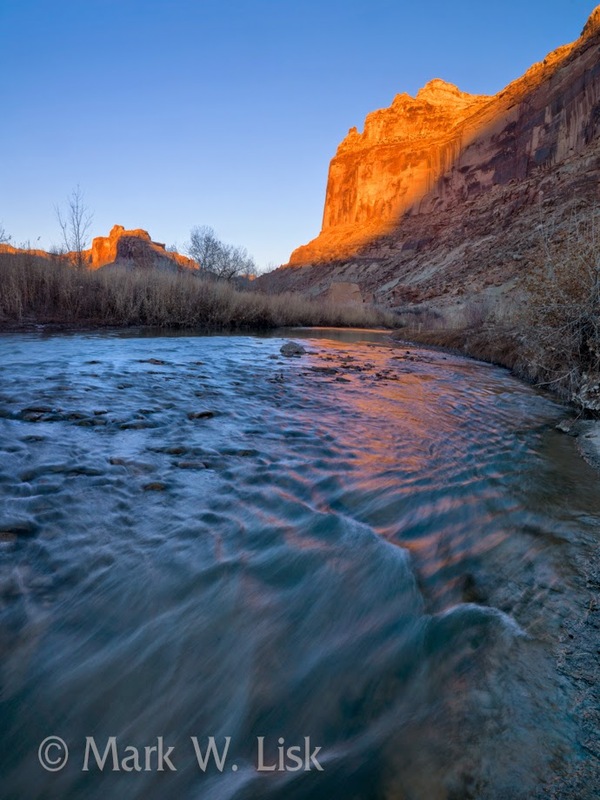 The old railroad grade or the Green River cutoff road continues from Castle Dale, (Hwy 10) crossing the flat rim below the Cedar Mountain and on to eastern edge of the reef near Green River (Hwy 6). This is the main access road in the northern part of the swell. About midway down the Green River cutoff road. 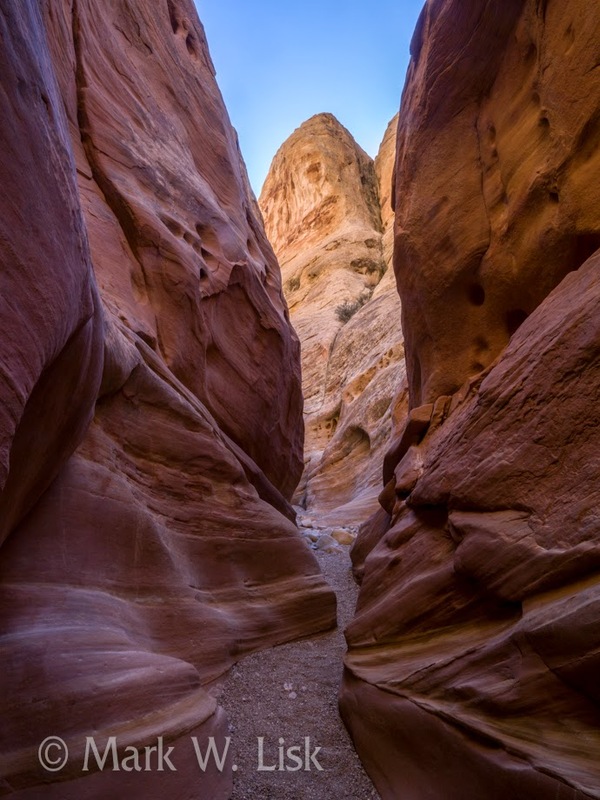 I drop through sandstone guardians that marks the entrance south into the Buckhorn Gulch wash. The road is gradual and descends along a cottonwood lined wash, leading to the famous Buckhorn Gulch Pictographs. 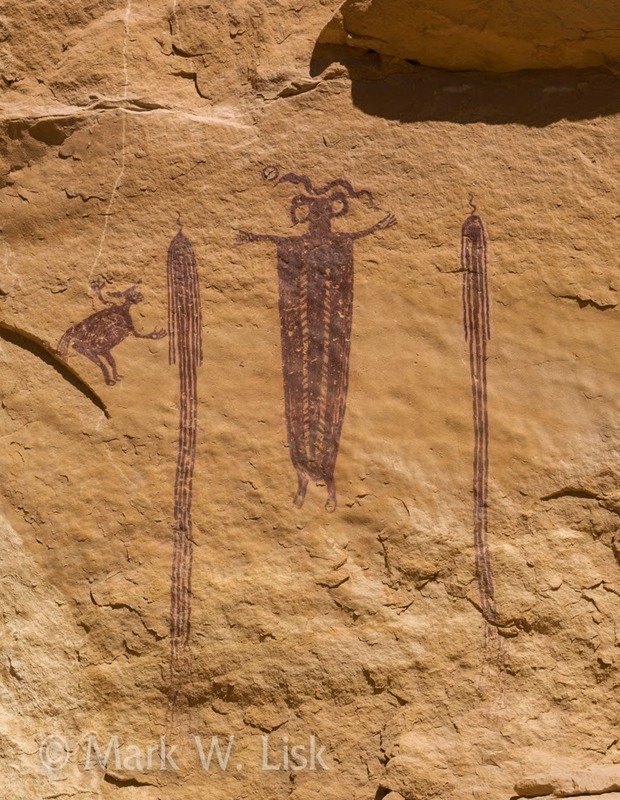 A 160-foot long stone canvas painted by ancient dwellers of the San Rafael. Not much further down the Gulch the canyon begins to widen in it anticipation on it confluence with the San Rafael River at the Swinging Bridge. 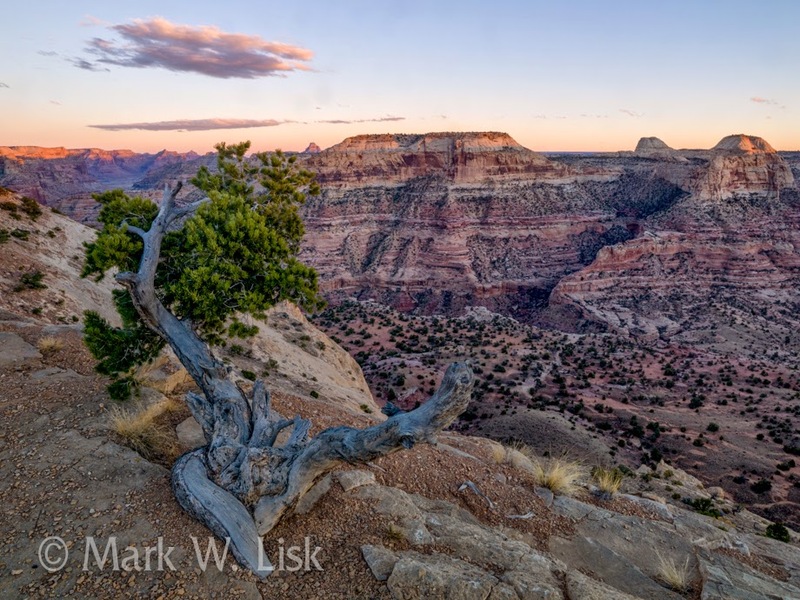 Here you are at the end of the “Little Grand Canyon," at the base of the Wedge Overlook, looking up toward the raven’s lair that echoed from the night before. From the Swinging Bridge heading south the formations begin to emerge as single features and are reminiscent of the formations of Monument Valley or Valley of the Gods. Each butte more defined as you climb up from the river bottom to view massive configurations, like Bottle Neck and Window Blind Peaks. Then up onto the grassy limestone flat, typical of the central regions of the swell, with long views of the Cain Wash to the West and Mexican Mountain to the East. The road (Cottonwood Draw Road) continues south over rolling grass hills to exit 131 on Interstate 70. The highway marks the mid-point of the San Rafael Swell, from here I cross under the highway to access the Southern reef via the Temple Mountain road. Shortly encountering a sign that reads, “Head Of Sinbad”. I don’t care who you are, when you see this sign you will be immediately compelled to alter your course and check it out. 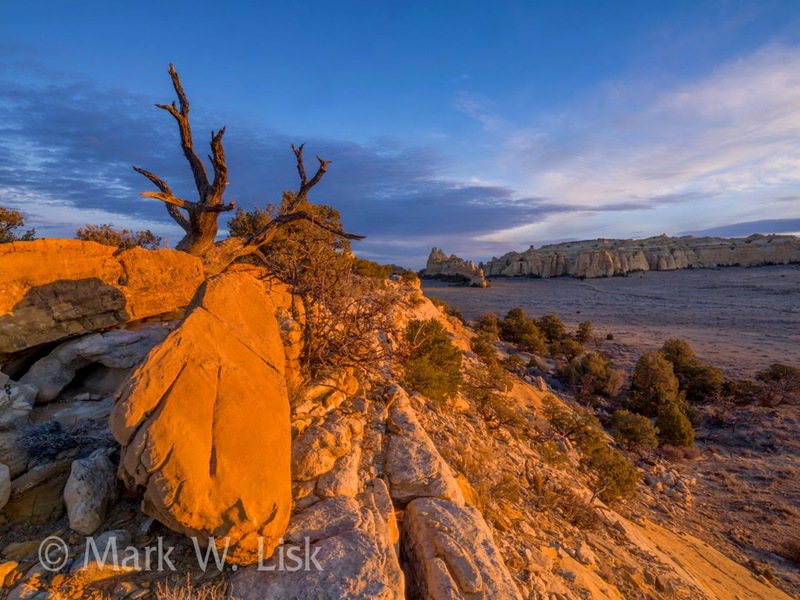 A short side trip takes me west to the highest elevation of the swell and to an impressive blond ridge of Navajo Sandstone at Locomotive Point and to some of the finest pictographs in the area. This ridge seems to be the dividing line north and south. Working my way back southeast on one of many roads heading back to the main Temple Mountain Road, crossing over the grassy central section of the swell. Temple Mountain and the eastern edge of the swell will soon come into view. By far the most dramatic part of the San Rafael, housing numerous slots and tanks. The road breaches the reef south of mountain at the Temple Mountain Pictographs and breaks through white sandstone and onto the flat San Rafael Desert, and Goblin Valley State Park. 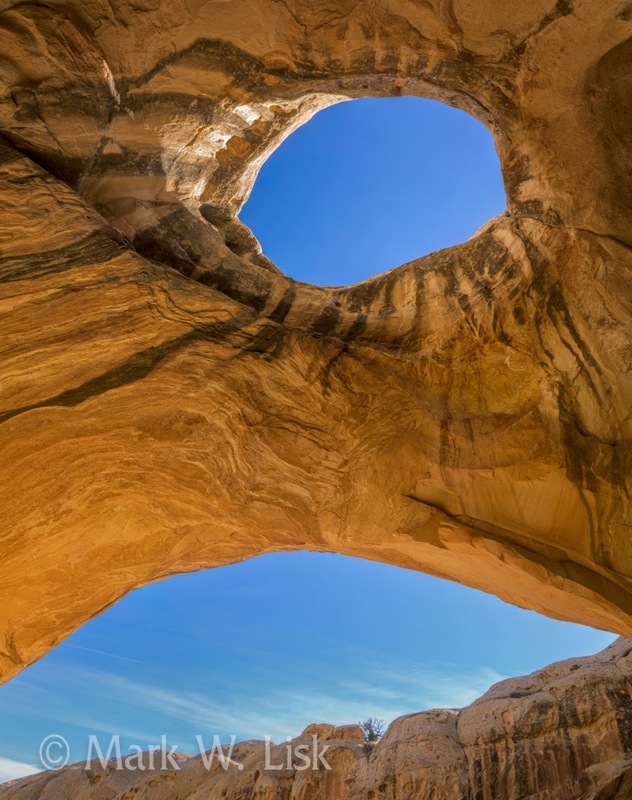 The silky white sandstone reef is inviting at first site. Taunting me to venture and explore its smooth washes and alcoves. From my camp along the reef I have an amazing view of Wild Horse Creek. Not the creek itself but an undaunted incision through stone, and centuries of time within the abrasive horizon. A slow and constant rhythm continues. The raven circles, and disappears into an opening in the reef leading me towards an alcove about mid way up. Following small water filled tanks along the sheer walled opening to a hidden alcove, a place of power. A place I can peer into the past through the Eye of Sinbad, up to the azure sky, where the raven speaks. In-between seasons, when access to the Owyhee Canyonlands is at its worst, it is hard to get inspired to hike and photograph in the Owyhees. The muddy roads and lack of sunshine in a harsh desert is quite surprising, that coupled with a fog inversion, makes it that much more difficult to become encouraged to venture very deep into the Owyhee Desert. 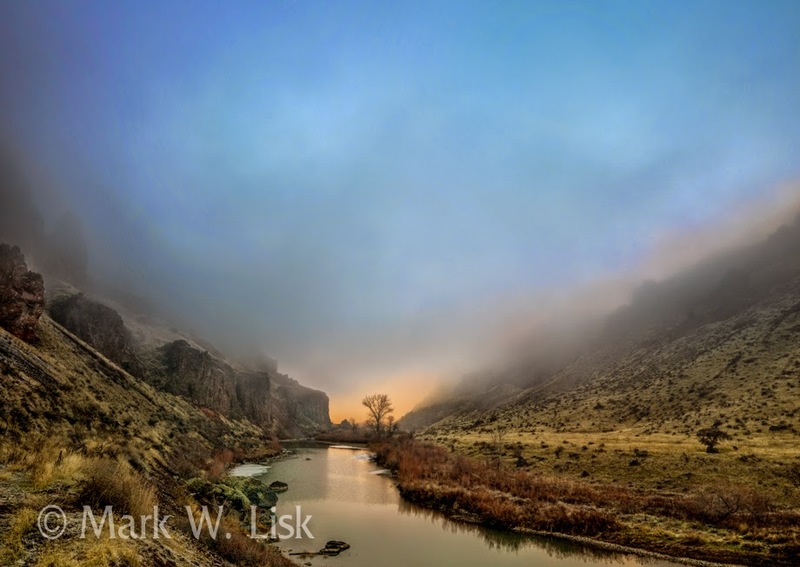 Think about a quick trip up the Lower Owyhee River. Roughly from it confluence with the Snake River to the Owhyee Damn. The road is paved and the scenery is fantastic along this world class Brown Trout Fishery, especially when you begin climbing up the canyon towards the Damn above the fog. Note.....At the end of the road several miles past the Owyhee damn at the Indian Creek Boat Ramp look for a great hike up the old Fisherman Road that heads South up to the rim for several impressive viewpoints overlooking the Lake Owyhee State Park.